Bake it. Hide it. Infused with Basil & olive oil, with loads of Spanish sundried tomatoes, this is the ultimate ciabatta for tearing and dipping. And sharing if you must. 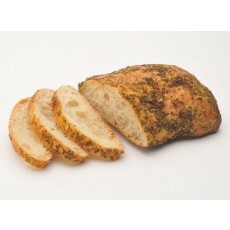 Ingredients: wheat flour, water, sundried tomato flakes, salt, yeast, olive oil, basil. We've got a sinful one for you. Set your taste buds on fire with this hot chilli ciabatta halo. Try it sliced, straight from the oven, and cool it with decadent soft cheese. A handmade, stonebaked, additive-free indulgence. Baking Instruction: Defrost for at least 30 min at room temperature. 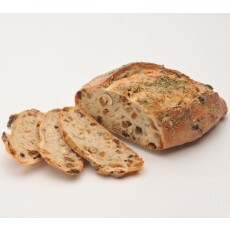 Remove from packaging, sprinkle the loaf with water and bake midoven at 180°C - 200°C for 5 - 7 min. Allow to cool before slicing. Ingredients: Wheat flour, water, fresh red chilli peppers (if unavailable green chilli peppers), salt, yeast. Indulgently good for you. Made with 50% water and a hint of semolina, a longer lasting, lighter taste. Slice it and enjoy a simpler, indulgent taste with less guilt, fresh or toasted. Baking Instructions: Defrost for at least 30 min at room temperature. 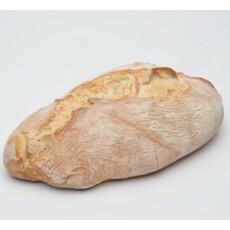 Remove from packaging, sprinkle the loaf with water and bake midoven at 180°C - 200°C for 7- 9 min. Allow to cool before slicing. Ingredients: wheat flour, water, durum wheat semolina, salt, yeast. Do what you want with it. Looks innocent enough, but this versatile little beauty will go with anything. Chunk it ‘n’ dunk it or rip it ‘n’ dip it. A handmade, stone-baked, additive-free indulgence. 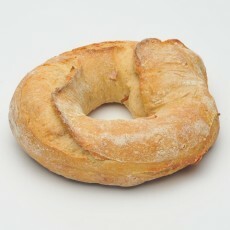 Ingredients: wheat flour, water, salt, yeast, extra virgin olive oil. Share if you dare. 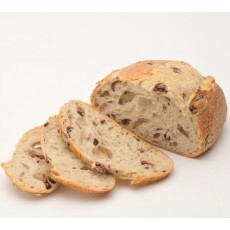 Fully matured Kalamata olives are added to a light dough to create this intense and luxurious ciabatta. Eat by itself or dip into aged balsamic and virgin olive oil. Baking Instructions: Defrost for at least 30 min at room temperature. Remove from packaging, sprinkle the loaf with water and bake midoven at 190°C - 210°C for 7- 9 min. Allow to cool before slicing. 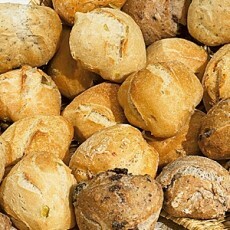 Ingredients: wheat flour, water, olives, salt, yeast, olive oil. Allergy advice: Contains gluten. May contain traces of soya, milk, celery, sesame & edible nuts. May contain olive stones. Irresistible to cheese. Wheat and rye floured loaf infused with oven roasted onion. So good with cheese, it could bring tears to your eyes. Baking Instruction: Remove from packaging and defrost for 30 min. Sprinkle the loaf with water and bake mid-oven at 190°C - 210°C for 8 - 10 min. Allow to cool before slicing. 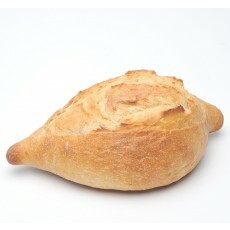 Ingredients: wheat flour, rye flour, water, roasted onion, sourdough, salt, yeast. Tease your tastebuds. 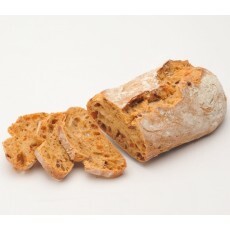 A truly intense & aromatic loaf packed with sweet walnuts. 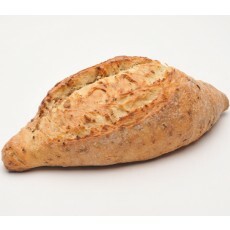 The natural choice for mature Cheddar cheese lovers or enjoy toasted with just butter. Baking Instruction: Remove from packaging and defrost for 30 min. Sprinkle the loaf with water and bake mid-oven at 190°C - 210°C for 9 - 11 min. Allow to cool before slicing. 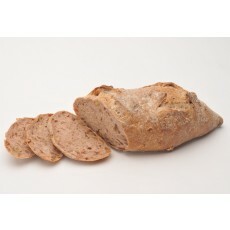 Ingredients: Rye and wheat flour, water, walnuts, sourdough, potatoes, salt, yeast. The sandwich maker’s dream. A rich and moreish loaf, with a delicate hint of sesame seeds. 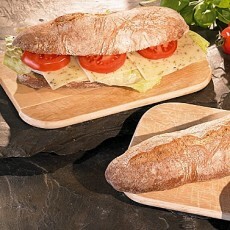 Great sliced, thick or thin, sandwiching your favourite filling. Baking Instructions: Defrost for at least 30 min at room temperature. Remove from packaging, sprinkle the loaf with water and bake midoven at 180°C - 200°C for 12 - 15 min. Allow to cool before slicing. 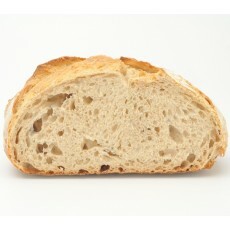 Ingredients: wheat flour, water, sourdough, wholegrain wheat flour, sesame seeds, rye flour, salt, yeast. Naughty and nice. A feast of grains, nuts and fruit, including hazlenuts, sunflower seeds, pumpkin seeds & apple. Nobbly on the outside, healthy on the inside. A handmade, stonebaked, additive-free indulgence. Baking Instructions: Remove from packaging and defrost for 30 min. Sprinkle the loaf with water and bake mid-oven at 190°C - 210°C for 8 - 10 min. Allow to cool before slicing. Not as sweet as I look. Laden with fruits, nuts and honey, this indulgent loaf is just dying to be covered with butter and jam. Baking Instruction: Remove from packaging and defrost for 30 min. Sprinkle the loaf with water and bake mid-oven at 190°C - 210°C for 7- 9 min. Allow to cool before slicing. 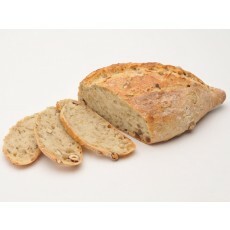 Ingredients: wheat, flour, water, raisin, cobnuts, potatoes, sourdough, honey, salt, yeast, rosemary. These amazing handmade rolls, are part-baked and take less than 5 minutes to bake from frozen. Now sold in a resealable bag making them a must have for every freezer. Five amazing flavours: Olive, Pepperonici (spiced green pepper), Tomato & Basil, Herbs and Natural, all based on an Italian style soft dough with thin crisp crust, which have been made by hand and baked on stone. Mixed Starter Hamper containing 30 mixed Rolls & 5 speciality loaves, providing fresh bread for your Weekend! With free delivery.